Facebook has more than one billion monthly active users and many people don’t use it to the full potential. 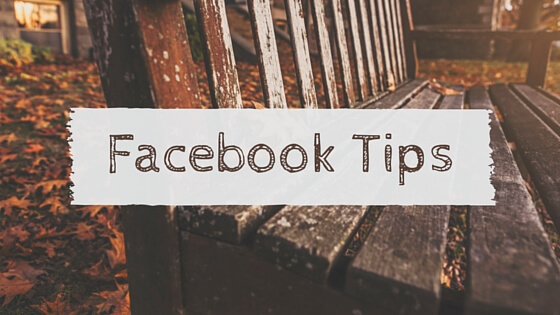 This detailed tutorial will help you know many Facebook tips which you may not know already. You can tailor your News Feed updates according to your preferences — ‘Top stories’ or ‘Most recent’. To do so, click on the down arrow present on the right side of the News Feed link and choose appropriate one. Top stories will present you updates with the popular posts when you were offline and Most recent will present you with the recently shared posts from your friends and liked pages. To add a link to your Favorites, hover over the link and click ‘Add to Favorites’. To rearrange your Favorites list, hover over the list and click the gear icon. Then, click rearrange and then change the order of the list by dragging the hamburger icon. Once you’re done, click Done. You can also remove links from Favorites by repeating the same steps and selecting ‘Remove from Favorites’. Facebook now displays popular topics — ‘Politics’, ‘Science and Technology’, ‘Sports’ and ‘Entertainment’. You can also hide the Trending item by hovering over to the item and clicking on the X button to see Trending list according to your preferences. Go to this directory and you can find all the people & pages present on Facebook. You can also search for non-latin names. Facebook now has an improved Pages directory that lists some of the popular places. You can see all your stories from the same date on different years through this nostalgic feature — On this day. You can change the preferences such as turning off the notifications or you can filter some of the people and dates which you don’t want to see. Your Facebook account includes a set of Friends lists such as your location, education, Close friends (your best friends), Family, Acquaintances (less updates from friends on this list) , Restricted (people with whom you don’t want to share with), etc., If you add your friends to ‘Close friends’, thereafter you will see more updates from them. You too can create a new Friends list and add members to your list. You can also create a new Interests list and here, you can add both friends and pages. You can also archive list by clicking on the gear icon, then select ‘Archive list’ and then restore them if you need. Your homepage News Feed may include all the updates from your liked pages and people you follow. However, it may be combined with your friends’ updates. To view updates from your liked pages and people you follow, you can go to Pages feed or Pages & Public figures feed. With Facebook Events, you can view Nearby events, your friends’ birthdays, host an event and lots more. There is also a very useful Calendar feature that helps you keep tracks of your Friends’ birthdays in a neat monthly format. With Facebook Groups, you can do much more than sharing updates — You can add files upto 25MB from you computer or from Dropbox. You can also create docs using the Facebook default editor itself. Everybody knows how to see their received friend requests, but you can also see your Sent friend requests by clicking on Friends icon present at the top, then select See All and click ‘View Sent Requests’. Facebook now allows you to send GIFs and files in chat. You can view the photos you have sent and received in your chat by going to Messages and clicking on the gear icon, then select ‘View photos in thread’. There is also a web version of Facebook Messenger which you can use exclusively for chatting purpose. There are some refinements which you do to your notifications. You can get fewer notifications for things you don’t wish. When you hover over certain notifications, an X mark will occur. Click the X mark, then select Okay. To view all notifications, you can select See all and it will display all the notification from the beginning. You can also get your notifications through RSS by selecting ‘Get notifications via: RSS’. The thumbnail of your profile picture appears everywhere on Facebook. To edit your thumbnail, go to your profile page, then hover over to your profile picture and select Update Profile Picture. Then, select ‘Edit thumbnail’ by clicking on the pencil alike button. To do this, select More and then ‘Manage Sections’. Now, you can drag to reorder the sections according to your taste. You can also hide the sections by unchecking the check box and then, Click Save when you’re done. Activity Log is a very useful feature in Facebook. It helps you keep track of everything you’ve done so far in your account. To view your Activity Log, go to your profile and click ‘View Activity Log’. It is split up into many sections. You can also go to Activity Log by clicking on the drop-down arrow present on the right-top and selecting ‘Activity Log’. You can preview how your profile is seen to the world through this feature. To do so, go to your profile page and click three dots seen next to Activity Log. Then, select ‘View as’. You can also View how your profile appears to a specific person by selecting ‘View as Specific Person’ and then entering the name. To do this, choose the story which you want to highlight and then select down arrow present on the right-side of the story and click ‘Highlight’. Now, a star will appear to the right-side of your highlighted story. Facebook now allows you to tailor News Feed according to your preferences. To do so, click on the drop-down menu and choose ‘News Feed Preferences’. Here, you can prioritize which you wish to see first and unfollow people. To get less updates, choose the story of that specific Person or Page and then select down arrow to the right-side of the story and choose ‘Hide post’. Then, select ‘See less’. That’s it! Now, you will see fewer updates from them on your News Feed. Facebook has recently made changes to News Feed preferences. You can see specific People or Page updates on the very top of your News Feed by selecting ‘See First’ on Following button (or Liked button in case of Pages) present in their Timeline. To get notifications, you can select ‘Get notifications’ on the Friends button (or Liked button in case of Pages) present in their Timeline. If you wish to get notified for a specific story in your Timeline, click on the down arrow seen on the right side of the story and select ‘Turn on notifications for this post’. To turn off annoying notifications, repeat the same steps and select ‘Turn off notifications for this post’. You can also turn off notifications from your tagged posts by repeating the same steps. When there are more comments for a story, Facebook allows you to change the default view of comments. Choose the story, select comments and then select from three options — ‘Top Comments’, ‘Most Relevant’ and ‘Recent Activity’. Facebook also allows you to post GIFs, images and stickers in comments. To add a GIF in your comment, drop the link of your GIF in the comment box. At present, certain services are only supported. Facebook allows you save your favorite stories and see it later. To save a story, click on the down arrow present on the right-side of the story and then select ‘Save post’ (or ‘Save link’ in case of Pages). You can see your saved collection by going to Facebook saved stories. It is categorized into different sections — ‘Links’, ‘Videos’, ‘Photos’, ‘Places’, ‘Music’, ‘Books’, ‘Movies’, ‘TV Shows’ and ‘Events’. Ticker keeps you updating what your friends are doing. However, if you don’t wish to see it, you can hide it by selecting the gear icon on the right sidebar and then, select ‘Hide Ticker’. You can also hide groups and games in the sidebar. You can also adjust the size of the Ticker. To do so, hover over to the end of Ticker and the start of Facebook chat. Now, mouse cursor will change to hand icon. Now, drag and increase or decrease the height of the Ticker. You can close all the opened chat tabs at once by selecting ‘Close All Chat Tabs’ present in the sidebar gear icon. Username is what appears on the URL when your profile is seen e.g., vijay.soundararadjou in the case of https://www.facebook.com/vijay.soundararadjou. To do so, go to Settings and then select ‘Username’. Note that, Facebook allows you to change your username only once. To increase your account security, turn on Login Alerts. To do so, go to Facebook settings and then Security tab. Click ‘Login Alerts’. This will notify you if someone other than you has logged in to your account. You can customize your alerts according to your preferences. If this setting is turned on, when you login to your Facebook account from your browser or your app, it will save that login to your account. So, when you login again from the same computer or app, you won’t be notified. Trusted Contacts helps you recover your account if you have trouble accessing your account. You can choose three to five close friends. You can enter the codes you receive from them and regain access to your account in case of trouble. When you have turned on ‘Login Alerts’, your browser and app will be saved. Here, you can view and revoke access to the browser or app in case you don’t use it. To see your Active Sessions, head over to Facebook Security settings and select ”Where You’re Logged in”. Here, you can see your current logged in sessions. You can also see IP address by hovering over to the Location. Select ‘End Activity’ to logout from that session remotely. Legacy Contact feature allows you to take care of your account if something happens to you. To do so, go to Facebook Security settings and select ‘Legacy contact’. Here, you can add a friend to take care of your account or choose to permanently delete your account if something happens to you. You can add your mobile number to Facebook for increasing security to your account. You can also receive notifications in the form of texts. To activate Facebook Mobile, go to Settings and select Mobile tab. Customize it according to your preferences. If Follow is turned on your account, you can customize your Follower Settings by going to Facebook settings and then, select ‘Follower Settings’. Here, you can customize comments, notifications and username. You can also turn off Follow by choosing ‘Friends’ from the drop-down. You can also add a Follow button to your site. Your Twitter account can be connected here. You can turn off videos auto-play and also select default quality of videos (HD or SD) by going to Facebook settings and then, select Video Settings. To do this, go to your friend’s timeline and click the three dots present on the right-side and then select ‘See Friendship’. Now, you will see from when you have been friends and all your tagged posts, likes & shares. Everybody knows how to deactivate an account, but you can also permanently delete your account by going to Delete My Account. Your account will remain in deactivated state for 15 days. If you have changed your mind, you can re-activate it or else, it will permanently deactivated. To do this, head over to Facebook settings and select ‘Download a copy of your Facebook data’ link. This includes all the information about your account. To delete your Search history, go to Activity Log and in the left pane, click more link under comments. Then, select Search and click ‘Clear Searches’. All the posts you share may be Public or Friends. You can also share with some specific people by selecting More Options in the audience selector, then Choose ‘Custom’ and specify the people with whom you wish to share. You can block Game invites by adding friends to the Block app invites section. To do this, go to Settings and then select Blocking. Then, add the friends in ‘Block app invites’ from whom you wish to stop receiving invites. You can download any picture from Facebook by clicking on the photo and selecting Options present at the bottom of the picture. Then, select ‘Download’ to save it.